Super duper awesome thanks to my snarky sister Lindsey who takes wickedly good photos of cards!!! The snarky sisters had a card swap where we each made and sent a partner a snarky card....well holy momma was that SOOOOOOO much fun!!! My card had a wee bit of profanity on it, which for anyone who knows me will not be much of a surprise, and I did warn Lindsey in advance. 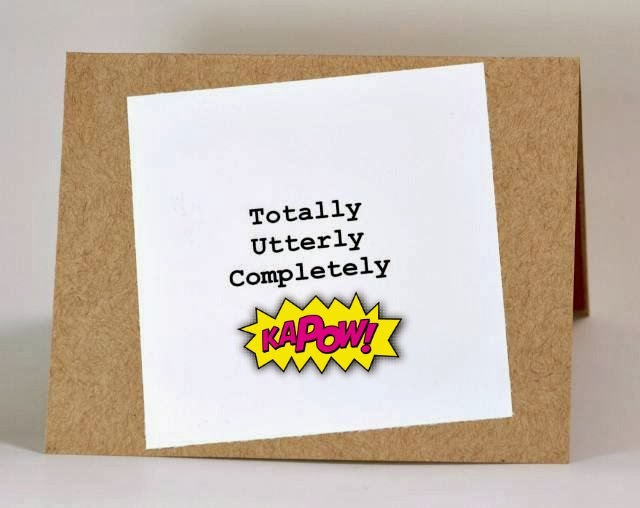 So here is my snarky card swap, I used pixlr.com to add the KAPOW sticker because I am not really out to purposefully offend anyone, well not most of the time anyway...but if you imagine a certain efff word under that sticker, you'll get the snarky gist of the card. Did you see that there is an actual take out box in that picture??? Seriously!! Lindsey is awesome!!! Oh, that's so true! I _am_ KAPOW!!! Love your card, Donna, best ever! 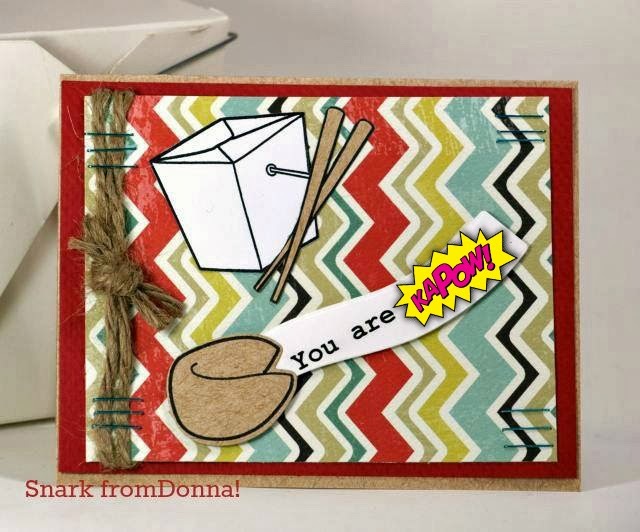 Donna, that is snarky...I can imagine what might be under the kapow! ;-) Awesome card Lindsey! great card love the censoring!!! WTG with the snarky card! I can tell all your peeps, Donna -- it looks even better in person, and without the censoring! Truly, one (insert appropriate adjective here) awesome card!